This article describes how to build a DIY low-budget AVR-based infrared remote control for Canon cameras. The reverse-engineered communication protocol of the RC-1 is described here. The RC-1 lets you trigger the camera instantly or with a delay of 2 seconds from a distance of up to 5 meters (~16 ft). It comes in very handy when taking long exposure pictures or for HDR photography. 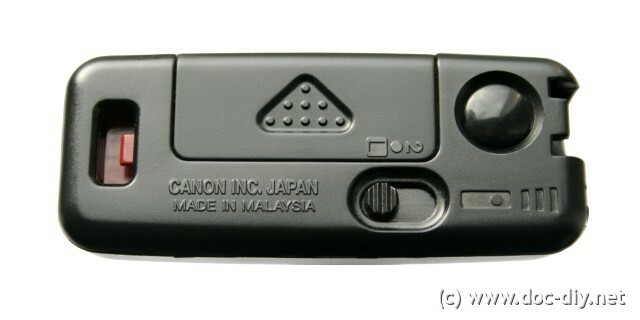 The presented circuit can be used as part of DIY interval triggers for smaller Canon cameras without the external trigger connector. In bracketing mode the RC-1 lets the camera shoot a whole series of images at once! It is recommended to read the RC-1 communication protocol description first. The first circuit I made was based very much on the original Canon (or Mitsumi, see image above) design. It used a crystal oscillator to provide a precise clock to the microcontroller. The IR-LED was driven by an additional NMOS transistor allowing higher current than the controller outputs can source. After I got it working, I simplified the schematics successively to reduce the part count and make it more easy to build. The schematics of the initial "high-end" version is here. The simplified version is shown in the picture below. I was able to trigger the Canon EOS 400D from more than 5 meters (~16 ft) with both versions. The simple version had slightly more failed trigger attempts. I recommend to build the simplified version though. In the simplified version the crystal oscillator was replaced by the internal 8 MHz oscillator, saving three external parts. The disadvantage of this solution is that the frequency is drifting slightly with the supply voltage and temperature. Details on this behaviour can be found in the "Electrical Characteristics" section of the Attiny25 data sheet. The most radical simplification was the elimination of the transistor. I found out experimentally that driving the IR-LED directly from paralleled microcontroller pins is powerful enough to trigger the camera from about 5 meters (~16 ft). Finally the voltage reducing diode has been dropped increasing the supply voltage to the "absolute maximum" value of 6 V. It seams to be no problem for the ATtiny25. I don't recommend to leave the mode selector input pin unconnected in the simplified version. I had some sporadic shots in the wrong mode. The program (simplified version) was written in C and compiled with the avr-gcc compiler in the AVR-Studio. The _delay_ms function was used to generate the delays. After applying power to the controller, pin PB0 is tested for its level. If the level is high (pin not connected, internal pull-up active), the instant trigger signal is emitted. If the pin is tight to ground, the delayed trigger signal is send. After sending the pulses, the microcontroller is put in power-down mode to reduce the power consumption to the minimum. When the pushbutton is released, no current is drawn from the battery, except the leakage current of the capacitor. A high quality cap should be used to keep this current low. The LED output signal is present on pins PB1 and PB2. The pins should be used in parallel if driving the LED directly as in the simplified circuit version. For some inexplicable reasons I wasn't able to parallel more than two pins. Before compilation, the microcontroller clock frequency must be specified in the c-file header according to the oscillator used. If the internal 8 MHz oscillator is used as clock source, an F_CPU of 7.9 MHz is a good choice. The reason for the difference is the voltage drift of the internal RC-oscillator. The nominal frequency of 8 MHz is specified for a supply voltage of 3 V. It's decreasing slightly for higher supply voltages. The dependence is documented in a diagram it the data sheet of the controller. #define F_CPU 7900000 // clock frequency, set according to clock used! By the way, most digital cameras are sensitive to infrared light in the preview mode, so you can see IR-diodes blinking on the display. This might be helpful for basic debugging of the remote control circuit. Your RC-1 clone doesn't work? Check, if any signal is present at the IR LED pins. Use a loudspeaker if no scope at hand. In case you can't hear anything probably the programming went wrong or the clock source is not correct in the AVR. If the signal is audible, use a video camera or a simple digital camera (mobile phone?) to check the IR signal. Cheap photo equipment is usually sensitive to IR light. In total darkness you can usually see IR LEDs glowing with the naked eye. Do not look directly into the beam! Is the polarity of the IR LED ok? An IR LED and an IR photodiode are two different things. In case the IR light is visible and the camera not responding: Check camera settings, the remote/self-timer option must be on! If ok, check the program timing. The _delay_us() routines in the code need a proper setting of the F_CPU variable. A sound card can be used instead of a scope to analyse the signal. Check the max input voltage before! Can I program tiny45 with this file and same fuse bits and that work normally ? dont need compile again for tiny45 ? the code for the tiny25 will work fine with the tiny45 and tiny85. may you compile this program for attiny45 ? How can I obtain this code ported to PIC? I've try to create my own (with PIC, not AVR ;-) ), but doesn't work. The signal is good, time too and I use IR LED 940nm. I've a question : what is IR wavelength capability for EOS400D? In total darkness you can usually see IR LEDs glowing with the naked eye. Do not look directly into the beam! Is the polarity of the IR LED ok? An IR LED and an IR photodiode are two different things. Thanks, this project was very helpful... i fiddled one together with spare parts (a bit perfboard, one spare atmega644, an IR-LED floodlight from an old security camera (i changed the resistors to get 2A pulses), switched with a irf1010, one 7805 for the avr and a bunch of 1000µF/35V caps for the IR-Light and 8 mignon batteries in a battery-holder, everything taped together). ve just cobbled together a version using an ATtiny85v, an external 8MHz oscillator, a ZTX658 driving two IR LEDs all running from a CR2032. Works great with my 500D, so thanks very much. Just wanted to say thank you for publishing this info. I've just cobbled together a version using an ATtiny85v, an external 8MHz oscillator, a ZTX658 driving two IR LEDs all running from a CR2032. Works great with my 500D, so thanks very much. Great idea! Many people ask for a bigger range of the IR remote, because they mount the camera on pole tripods. Nearly 60 Minutes of work/testing. It has a range of > 15 meters (lenght ob backyard) or from one room to the other (IR bounced on the walls through the doors). 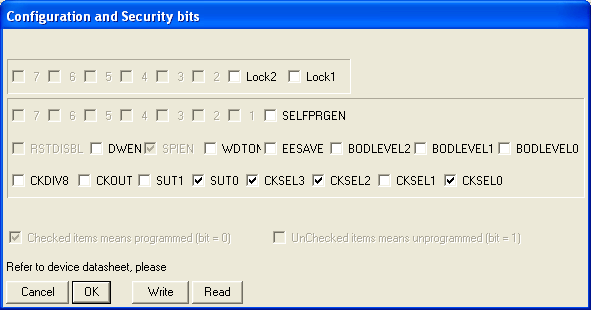 I will puzzle the fuse values for avrdude together and publish them here soon. Until then, check the section "Memory programming" in the data sheet of the tiny25.